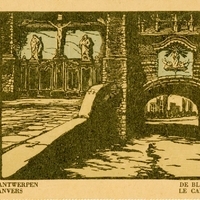 A postcard depicting the Bloedberg, or Butcher's Hall, in Antwerp, Belgium. The second hall was built in 1250, but when the first was built is unknown. It was originally founded as an indoor trade market, because Antwerp was one of the economic centers of the country. Originally published by J.-E. Buschmann. Wee, Herman van der. The Growth of the Antwerp Market and the European Economy (Fourteenth-Sixteenth Centuries). The Hague: Nijhoff, 1963. “Antwerp Butcher's Hall Postcard.” RICHES of Central Florida accessed April 22, 2019, https://richesmi.cah.ucf.edu/omeka/items/show/6657.